Nissan Datsun 1985 - 1986 - 1987 - 1988 - 1989 - 1990 - 1991 - 1992 -1993 - 1994 - 1995 - 1996 - 1997 - 1998. Nissan Pickup 1985 - 1986 - 1987 - 1988 - 1989 - 1990 - 1991 - 1992 -1993 - 1994 - 1995 - 1996 - 1997 - 1998. Nissan Navara 1985 - 1986 - 1987 - 1988 - 1989 - 1990 - 1991 - 1992 -1993 - 1994 - 1995 - 1996 - 1997 - 1998. Nissan D21 1985 - 1986 - 1987 - 1988 - 1989 - 1990 - 1991 - 1992 -1993 - 1994 - 1995 - 1996 - 1997 - 1998. Nissan Big M 1985 - 1986 - 1987 - 1988 - 1989 - 1990 - 1991 - 1992 -1993 - 1994 - 1995 - 1996 - 1997 - 1998. Nissan 850 1985 - 1986 - 1987 - 1988 - 1989 - 1990 - 1991 - 1992 -1993 - 1994 - 1995 - 1996 - 1997 - 1998. Nissan Hustler 1985 - 1986 - 1987 - 1988 - 1989 - 1990 - 1991 - 1992 -1993 - 1994 - 1995 - 1996 - 1997 - 1998. Nissan Camiones 1985 - 1986 - 1987 - 1988 - 1989 - 1990 - 1991 - 1992 -1993 - 1994 - 1995 - 1996 - 1997 - 1998. Nissan Power Egle 1985 - 1986 - 1987 - 1988 - 1989 - 1990 - 1991 - 1992 -1993 - 1994 - 1995 - 1996 - 1997 - 1998. Nissan King Cab 1985 - 1986 - 1987 - 1988 - 1989 - 1990 - 1991 - 1992 -1993 - 1994 - 1995 - 1996 - 1997 - 1998. - It's Prevents leakage of air conditioner to out. - It's Prevents water leakage to the cabin. - It's Prevents entry of dust. - It's Makes your car save by install the glass perfect. 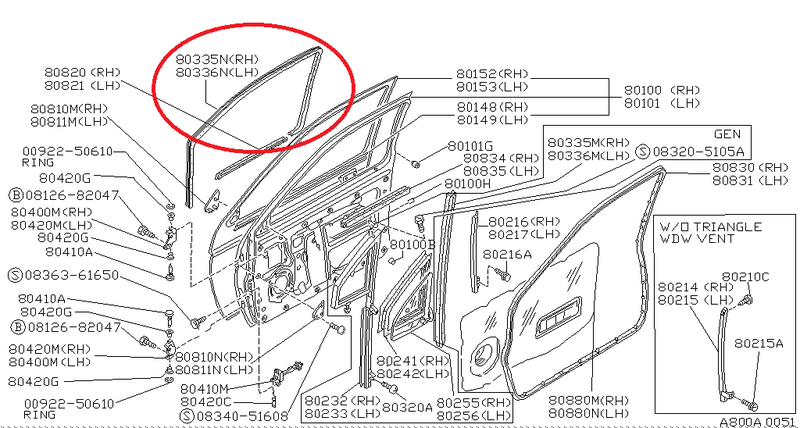 Nissan Datsun rear left glass run for full glass only. Nissan Pickup RL window channel. Nissan Navara rear left window weather strip. Nissan D21 flocked linned channel. 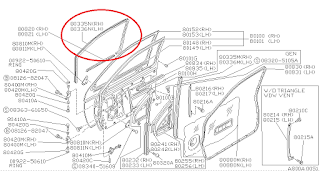 Nissan Big M window seal channel. Nissan Hustler rear left glass run for full glass only. Nissan King Cab flocked rubber glass run.